I’m not a parent but I have to admit that I am strongly considering the possibility only to read this to a toddler before bedtime. 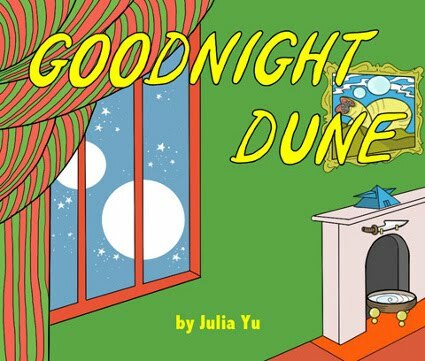 Conceived by artist Julia Yu after reading an article on College Humor (Five Sci-Fi Children’s Books) Goodnight Dune plays on the iconic illustrations of Margaret Wise Brown’s classic board book Goodnight Moon and represents the awesome power of geekitude when married with actual talent. After the break is the link to book (which you can read for free) and please, contact Ms. Yu and beg her to publish this immediately. I think I feel my geeky biological clock ticking.